Recently, we heard news of another local trade school closing, and would like to reiterate that we’re not going anywhere! PCI is actively enrolling for each of our nine programs, and would like to highlight some of the things we do to thrive in downtown Pittsburgh. This school hasn’t stayed open since 1980 through luck or happenstance; we continually strive for excellence for our students! The school that recently closed in downtown Pittsburgh stated that the reason was insufficient demand for their programs in this market. Interest in various programs may fluctuate over time, but there are always opportunities for our graduates, regardless of the program they choose. 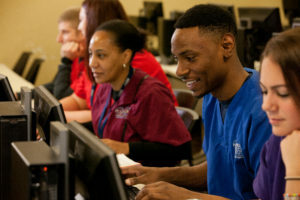 Whether you choose to pursue Dental Assistant, Veterinary Technology, or anything in between, you could start a successful career for yourself, and PCI wants to help you make it happen! Program directors at PCI such as Ms. Sherri Steele have talked about how important it is to help each student succeed individually. Every student has different strengths, weaknesses, goals, dreams, and capabilities that our instructors strive to accommodate. For example, we want our graduates to start their careers in places where they will feel confident and comfortable, so we try to help them with opportunities suited to their skills, personalities and goals. Quieter, more introverted graduates, for example, may not flourish in a high-intensity emergency setting, but may love working in a private practice or office with a calmer environment. We strive to help students find the ideal fit for them. At Pittsburgh Career Institute, we don’t bring ordinary staff and instructors into the family, we aim to hire the best! Ms. Sherri Steele is a great example of a staff member of who goes above and beyond for her students. She is the director for our Medical Assistant diploma program. Working with needles is an integral part of the program, and some students feel anxious about practicing this aspect of their training. One student was so nervous that Ms. Steele invited her to her office to practice on her own arm! With Ms. Steele’s help, that student was able to build confidence that she wouldn’t have been able to get just in the classroom. Going above and beyond is a big a part of how we teach! At Pittsburgh Career Institute, we place the education of our students above everything else. Part of elevating the education to a higher standard means that we strive to build a support network for our students. We foster a culture of family and support that is designed to help students pursue their career goals. Success, for us, is about the people we help and lift up along the way to achieving their goals. This culture is a huge part of what sets PCI apart from other schools. If you have an interest in working in the healthcare field, we offer many programs that could help you get where you want to be. Both degree and diploma programs are available, and all are geared toward helping you start your career with the skills you will need! Contact us to learn more about how you can get started today.